My earliest interaction with Non-Snob was reconnaissance/forward observation, namely due to my frequent trips to Colorado and acquisition of local specialties not found in San Diego. 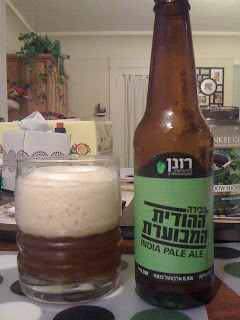 But I've been totally outclassed by my friends Jesslyn and Ronen, who made a recent trip to Israel and brought me back a bunch of local craft beer. Did you know that Israel has a burgeoning craft beer scene? Neither did I. Obviously I'm incapable of reading the label on this one, but per J&R, the name translates to "The Ugly Indian Beer", and it's a "Special Beer for Special People". Ronen was very excited about it because the beer shares his name. It apparently won a BIRA (Beer International Recognition Awards) 2011 Gold Medal. It's definitely unfiltered, because there's little yeasty bits floating around. It smells fairly malty (as the color would also suggest). There's also a bit of unexpected Belgian-like funk. Not a whole lot of green hop blast initially, but after it warms up a bit, some citrus shows up. Grapefruit in particular, a nice bit of complexity that a even a lot of American IPAs fail to achieve. And no mustiness in the malt, another pitfall they've deftly avoided. Flavor wise, this treads the line between the West Coast and English IPA styles. Intermediate in body, with a nice bitterness level that's neither overpowering or underwhelming. It's pretty much a right-down-Main-Street IPA, and I say that as a compliment, because it nails the basic IPA hallmarks. I didn't find a single flaw in craft- it's well-balanced, with a decently complex hop profile and a good malt back. It's not necessarily my ideal IPA style, but I wouldn't hesitate to buy it in a pinch. And given what's on the shelves out here in San Diego, that's no faint praise.